Collecting fragrances is something that I am still relatively new to. For years, I only wore Chanel Chance 'Eau Fraîche' and it wasn't until I stumbled upon Jo Malone's Peony & Blush Suede that I decided to branch out. With the addition of Chanel's Coco Noir to my collection this Christmas (a scent that was totally different for me), I decided that I definitely have developed a thing for fragrances. 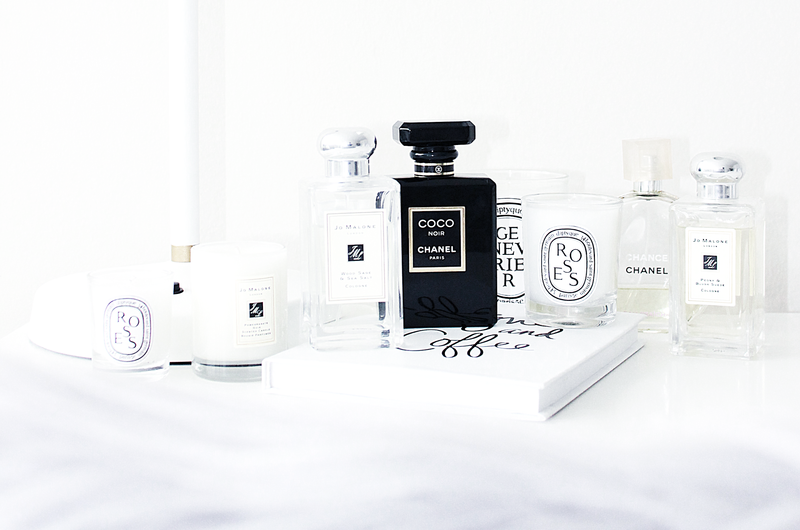 Above are a few of my favorite - including a few luxury candles! Chanel 'Coco Noir' : Without a doubt, the most unique fragrance out of my mix (you can even tell just from the packaging)! It's a darker fragrance, a bit seductive. It has citrusy top notes (grapefruit), that help to add and accentuate the rose and jasmine, and lastly it gets it's warmth from patchouli and sandalwood. The scent starts out intense upon first spray, but settles down to a really gorgeous scent. Chanel 'Chance Eau Fraîche' : My original fragrance (the one a lot of people would say smells like me). It's clean, crisp, and fresh. It too has citrus/floral roots that keep it light and airy - however those are highlighted by woody notes of amber and patchouli. This is one of those clean scents that I can just wear always. Jo Malone 'Wood Sage & Sea Salt'* : Wood Sage & Sea Salt is another fresh, clean scent that has a very natural feel. It's that perfect fragrance to close out summer with and start into fall. It literally smells like a late summer vacation a bit salty, a bit woody in a coastal, driftwood sort of way. Jo Malone 'Peony & Blush Suede'* : Along with rose, my other favorite flower is definitely the peony so it's no surprise I love this fragrance. The floral notes are offset by the suede - which helps to warm the fragrance up a bit. Diptyque 'Roses'* : Not your grandmother's rose scent is the only way I know how to describe this! It's not powdery or heavy - it's much cleaner and a little more crisp than standard rose. It has a tiny hint of citrus to it, which is what I think helps to keep it from being too over the top. It's a gorgeous fresh candle to burn. Diptyque 'Genevrier' : (or Juniper - which is an evergreen) continues with my usual streak of wanting clean and fresh scents. This one has a very woody feel - however it's very light and fresh and almost has a streak of mint to it. It's one of those that I just love to pick up and smell. Clean, and fresh. 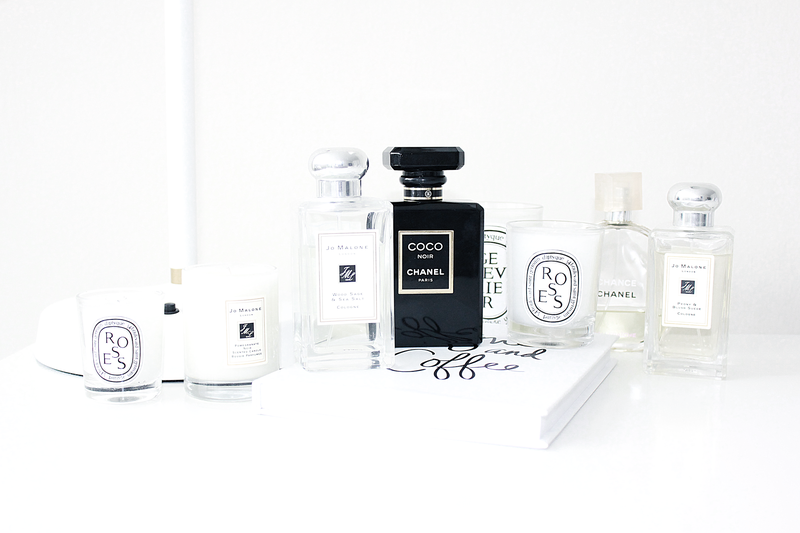 What are your favorite fragrances? What candles do you love best? Let me know in the comments!